Welcome to the home of Creatures, a program for the exploration of evolution, natural selection, genetic programming, and artificial life. Discuss Creatures in our forums. Creatures is now open source, under the BSD license. What does this mean? It means the source code is available, and you can do basically anything you want with it (including packaging it up and selling it, if you should be crazy enough to try), as long as you maintain credit. I'd appreciate it if derivatives were also open-source, but this is not required. For current users: if you've registered within the past three months (on or after September 1st, 2005), and you feel that this development makes your purchase worthless, contact me for a refund. Creatures 1.1.1 is available! Download now! Creatures requires Mac OS X 10.2 (Jaguar) or later. A bug in the neighbor-finding code was fixed. This affected communications and mating, which previously only worked in certain directions. The genome list now runs slightly faster. This also fixes a few situations where the program could freeze updating the genome list. Explore life, death, and evolution in a complete artificial environment. Creatures is an artificial life program. Animals live in Creatures' artificial world, seeking food, reproducing, and trying not to die. Each animal is controlled by a small computer program; the animal's brain. Occasionally, an animal's program is mutated at random. Most of the time, the mutation is bad: the program stops working, and the animal dies. But sometimes, the change is useful, and the animal passes its changed program on to its children. Successful changes spread through the population, and the animals evolve. The slow, stupid default program does well enough, until a fast eating machine evolves, eats all the food, and takes over. The resulting population explosion eats food faster than it grows back. The population starves, and a slower, less energy-intensive animal may gain the advantage. 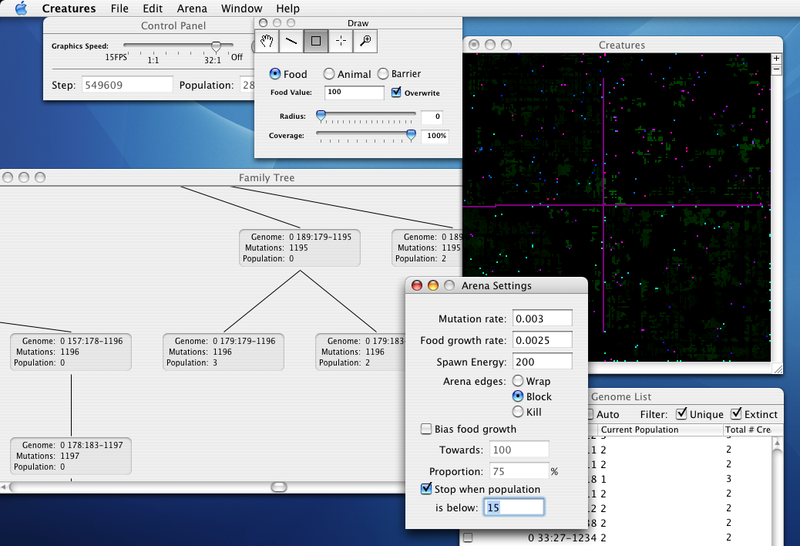 Crank the mutation rate up and see what strategies develop to survive the harsh environment. Create a world divided in two by a wall. Let them evolve separately, then connect them and see what happens when they meet for the first time. See how animals which evolved in a world of plentiful, rich food evolve to cope with a slow, steadily dwindling food supply. Write your own programs and see how they compete with the products of evolution. See how your programs evolve after generations of mutation. Collect a library of interesting programs you find while exploring your worlds. Track a program's heritage in the Family Tree, then dissect its program in the Assembler. Or create and experiment with your world in any way you choose. For more information, you may access the User's Guide online. For questions, comments, or support, contact Michael Ash at creatures@mikeash.com.